Good things don't last long. I'm sitting here coming up to my first weekend back in my college town. School hasn't started yet, but the amount of students present increase as everyday nears closer to the start of a new year. This year something is very different though. There are three new apartment complexes and one of them looks like a Florida resort that businesses would spend their company retreats at. To put it simply, student apartment complexes become a living party every Thursday, Friday, and Saturday of the week. Parking becomes a nightmare every weekend as hundreds of people are hopping from party to party creating troubles even for the residents that live there. So we meet a new apartment complex, which will remain nameless. I'll save the blabbing of its features, but you need to know its a huge complex. 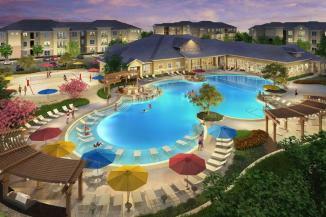 We are talking 12-16 buildings surrounding a huge clubhouse + pool, plus an infinite amount of parking. (shown on right). Now obviously this is a computer generated image, since I could not find any other real image depicting this area. Let me tell you though, its 100% identical to the above picture, every last bit. At my apartment complex, we have a pool. Except, ours is the size of a regular neighborhood pool and doesn't look like a tropical resort. The rules that have to be followed by my pool are also insane. To put it simply, don't even think about eating/drinking anything near the pool and don't bring any friends. Let's back up a bit and insert a quick little note. College kids are destructive. Every fraternity house wouldn't look like a dilapidated abandoned building, if this wasn't the case. Fraternities tend to keep the 1st floor and public facing front clean, but rest assured any floor that isn't the ground floor has seen its share of destruction. This is obviously due to the constant parties and then responsibility to clean it up afterwards. There are various gates into the clubhouse all requiring a simple 4 digit password, which any of the 800 residents could give you. The entire campus in a matter of hours know the new password anytime it changes. So keeping people out is a thing of the past until they carry out some new measures. We walked in, with a cooler full of beers, burgers, hot dogs and a variety of grilling materials. The doorman (my only accounted security of that night), looked inside our cooler and said, "No glass, looks good boys. Have a beer on me". Obviously no one in our group except two were above 21, but hell, we are in a college town, so who cares? As we walked in, I forgot for a second that this was still my college town. It looked like the spring break notably exaggerated in any college party movie. Women in their skimpy bikinis and men who had been on anabolic steroids since they were 12 walking around. Beer was everywhere. There was a mountain of cans and empty cases thrown in the corner, and my friend explained to me that those were just from tonight (as the pool area is cleaned everyday). It was unbelievable, it was a massive party. Students playing volleyball while drinking a beer, while the other half stayed with their chairs in the water sipping on drinks. It wasn't an incredibly hot night, this particular day. It was in the high 70's, but the amount of women in bikinis walking around wasn't suffering either. It seems once one person decided to get in the pool, all the shirts came off and everyone who was anyone had their drink in hand jumping into the pool. Rocks scattered across the pool area were pumping out a party music playlist that resembled that of my personal techno rave playlist. These sound rocks had a surprisingly good bass/treble levels as well. The night went on with what seemed a new army of faces every 45 minutes, with people coming and going. Drunken encounters were everywhere with the occasional girl who was revealing a bit too much of herself unknowingly while a couple of intoxicated guys were tripping over themselves into a chair. That is what happens when you mix slippery patios, water, skimpy bikinis and alcohol. The end was coming though for there was a midnight pool closing. Whether that closes the party going on around the pool and at grill, I don't know. I left around 11, as I had to work early. The next morning, I awoke earlier than I expected and it was quite chilly out. I took this break in the weather to go on a run. I planned my run so I could run by this apartment complex and see how it looked. I arrived there somewhere between 650 / 720 in the morning. There were a couple of employees out there. One was dragging chairs out of the water and fishing out the variety of cups / beers that had fallen victim to the water. While the other was re-arranging the poolside chairs and what not to put everything back to normal. All the beer cans and trash had been collected in some huge dumpster like container and the place was starting to look identical to the above image again. I took this opportunity to stop and stretch and watched everything from them cleaning the bottom of the pool to brushing the sand back into the sand pits. This place surely by 8am would be back to the beauty that it normally is. Now, I'll play the role of a common sense student. Probably because I was sober that entire night, but someone has to comment on it. I'm no chemistry student, but the constant dumping of chairs into chlorine water where they saturate overnight definitely won't last long without some serious damage to the chairs, slowly deteriorating them. Plus, school hasn't even started yet. We are still missing a couple thousand students. I can't even imagine what this place will be like on the first weekend of the school year. There is a reason every other apartment complex and fraternity house has rules. I stated it before, "College kids are destructive". There are no ways around it. There are just some kids out there that party to their hearts content, ignoring any damage they are causing and hoping someone else will take care of it for them. This complex gave them that, and it will be interesting to see what happens in a couple months.